Maintaining and growing NYC Mesh wouldn’t be possible without a dedicated community of volunteers! We welcome people with diverse skill sets and from all backgrounds to help out, contribute and lead. We are open to new ideas and initiatives, especially if you are ready, willing and able to make them happen. We like people who are self-motivated and autonomous but who also like to collaborate and work with others. Come talk to us about volunteering opporunities at one of our monthly Meetups. We’re super friendly! You can also reach out to us on Slack, our community message board. Or email us at help@nycmesh.net. 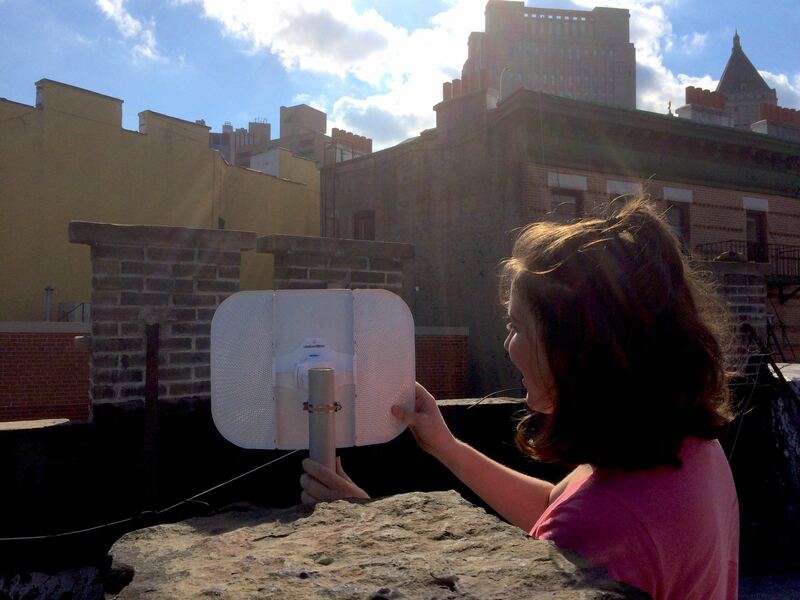 Installer #install Help connect new NYC Mesh members to the network (and help them reconnect when they have service issues). This involves installing and configuring routers and networking equipment on rooftops and in members’ apartments and carrying out configuration. Install team leader: Organize and lead site surveys and installations. Teach new volunteers how to install hardware and configure software. Communicate with new NYC Mesh members and the install support team. Help shape our installation best practices. Install coordinator: Inventory control, coordinating install teams, identifying viable installs, streamlining installs, working with contractors. Install planner: We have hundreds of node applications. See if you can join the rooftops together on our map and plan an install. This takes lots of emailing, phone calls and meeting neighbors. Network admininstrator #monitoring: Do you know Grafana, Icinga or Nagios? Know how to write bash scripts? Help us by monitoring nodes and alerting users to problems. Hardware and software hacker #hardware #software Get our firmware running on more devices. We need support for inexpensive 2.4GHz and dual band routers. Clone our nycmeshfeed on our github. Website developer #website Help us improve our website. Edit existing documentation and add new information. Help improve our message and outreach. We use markdown and git to collaboratively develop the website - both are easy to learn. Neighborhood organizer #neighborhoods Coordinate an install for people in your building or for your neighbors or a community organization or a local business. We prioritize installs that serve multiple members from one hub location. Community outreach leader #outreach Encourage people in your community to join NYC Mesh by distributing pamphlets and organizing informational events. Do you speak multiple languages? Help us reach out to people who don’t speak English and provide translation assistance. We aim to be a service for all New Yorkers. Grant writer and sponsorship coordinator #funding We need help identifying grants, writing applications and reaching out to sponsors. Project manager We have a lot of larger projects that require long-term planning, organizing and emailing. Donate Space #general We need space to store equipment (cables and antennas), prepare installs, and host MeetUps. Donate Money Donations are tax deductible and go towards expanding our network!